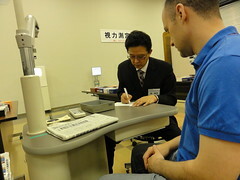 I teach English once a week at the World Optical College. WOC is a three year school for people studying to become opticians. Opticians are people who work in a glasses store and test the customers' eyes and make glasses, but they are not doctors. WOC is the school of Paris Miki glasses shop. On Sunday, they had a big Glasses Fair at WOC. 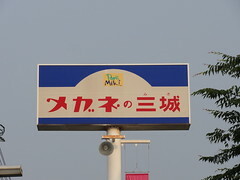 Tatsuki, Ayumi and I went there. I had my eyes tested and bought a new pair of glasses. My new glasses will be a little weaker than my current glasses. I will get the glasses next week. I think they look good, please tell me what you think if you see me wearing them. Ayumi's eyes are perfect, she doesn't need glasses at all. I usually only wear my glasses at night. I also had a hearing test. 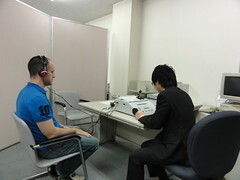 Ayumi often says that my ears are not good, but actually I did very well on the hearing test. My hearing is in good condition.